Update number two from Camp Buck Toms. Its been a great week so far and hopefully will end up being a legendary week. All the boys are eagerly earning new merit badges and enjoying it as well. We all have agreed on one negative though, the food is not by any means great. But we are all getting over that and trying to make the best of it. We sure did have a great meal tonight thanks to our very own chef Chris Nutley, He made a great meal consisting of chicken breasts wrapped in bacon, corn, and watermelon. It was delicious! Tyler working on his belt. Today my interview subject was Tyler. Tyler’s favorite part of the day was the climbing merit badge due to the fact that it was their first day climbing. The past couple days have been boring since it was rules and paperwork. Tyler says he has come to summer camp because “its fun and it gets your heart racing.” He also has come to gain more merit badges and move up in his rank. He is second class and he is moving up fast! Tyler’s favorite merit badge that he is taking is swimming, He likes it because he says he has made good friends with his instructor. He also appreciates that he can enjoy the waterfront without having to use up his free time. According to him it’s easy. 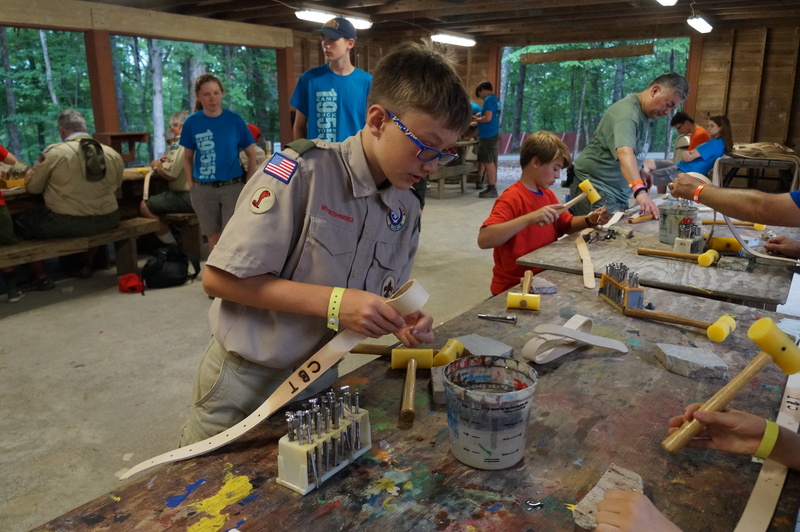 As we are fast approaching the end of summer camp here at Camp Buck Toms, We are going to try to make these last few days count and get as much merit badge work and rank advancement done as we all possibly can. It looks like there is a hurricane moving up the east coast and we may have some damp days ahead of us. We will prepare to stay dry and learn how to enjoy camp while its not so sunny and warm.